Former Oklahoma City Thunder guard James Harden might be getting all of the attention in regards to the MVP race, but there is a current Thunder star that deserves some, too. Unlike previous years, though, it is not Russell Westbrook. Instead, it is Paul George. 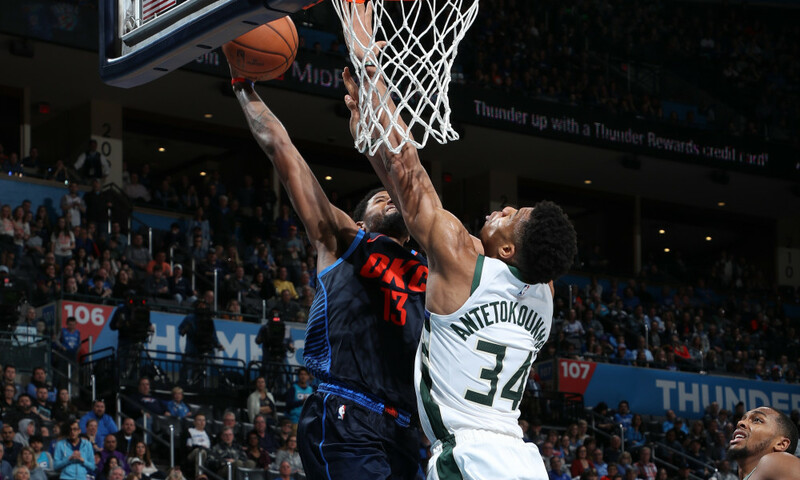 And what could say that he is an MVP candidate better than a dunk over Giannis Antetokounmpo in the fourth quarter on Sunday that just about locked up the eventual win? George got the ball, decided to take it to the rim, and he appeared to have no resistance. But the always ready Greek Freak soon moved into the way and forced George to do the only thing he could: go through. The rarest of posters ended up taking place, and George would end the day with 36 points and 13 rebounds as they beat the Bucks 118-112. He also made eight of the 12 threes he attempted, underlining the modern game of getting to the basket and making long range jumpers. Watch out Harden, George is hot on your trails. Luka Doncic just keeps on making history. The Dallas Mavericks’ teenage sensation scored 35 points in a 123-120 loss against the Toronto Raptors. Doncic also had 12 rebounds and 10 assists to go with it, handing him another triple-double. The history comes in because the 19 year old surpassed the points that LeBron was able to score as a teen way back in 2005 against the Bucks. He is now just the fourth rookie to ever reach the lofty standard of a triple-double with 35 points. Others on the list include MJ himself! According to his agent, Anthony Davis’ time with the New Orleans Pelicans could be just about up. The Brow has made it known through his agent, via ESPN sources, that he would like to be traded. He has told them he will not sign a new contract, so this is the avenue in which they will have to take in order to get some value out of their star player. Did LeBron’s campaigning sway him, or is he just legitimately looking to move on? The NFL Pro Bowl took place on Sunday, and a lot of wackiness ensued. On a nasty, rainy day, the AFC beat the NFC 26-7 as players played out of position and a fullback dominated the show with Anthony Sherman catching three passes for 92 yards. In the end, the MVP awards went to Pat Mahomes on offense, who tried to give it to the fullback and to Jamal Adams on defense. And finally, the United States Men’s Soccer team began a new era on Sunday with their first match under new coach Gregg Berhalter against Panama. Playing in front of a sparse crowd, no doubt still reeling from their failure to make it to the 2018 World Cup, the US comprehensively saw off the visitors with a 3-0 win. Two of the goals, from Djordje Mihailovic and Christian Ramirez, came from players making their debut with the team. The other came from a defender, who scored only his second goal of his short stay with them. It’s a good start, but there is plenty of more work to be done for them.